Efficiency of solar panels is how much sunlight is converted into electricity. It currently ranges from 15% (150 Wp per m2) for normal solar panels towards 20% (200 Wp per m2) for high efficiency panels. This means a 4kWp system takes 27m2 using normal panels but only 20m2 using high efficiency panels. However, a 4kWp system will produce the same electrical output with normal or with high efficiency panels – it is only smaller in physical size. And since you do pay about 25% more for the high efficiency most people would prefer the normal panels. Only with a very small roof do high efficiency panels become a viable option, since you can increase the system size. Multijunction Cells (31-44%) – Layers (up to 4) of different technologies shown below, most expensive to manufacture, only used for research at the moment. Thin-Film Technologies (13-23%) – Depositing rather than cutting a layer of material (can be either silicon, cadmium, copper or organic) which means it’s thinner and hence cheaper to produce. Limited mainstream availability due to lower efficiency, but main challenger for Christalline panels. 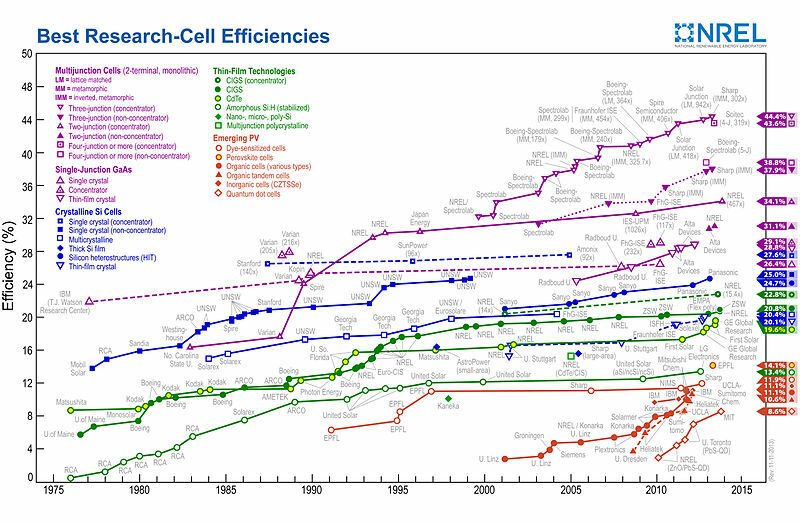 Emerging PV (9-14%) – Experimental research methods or materials, low but quickly increasing efficiency and some very cheap production methods, no mainstream challenger expected for next 10-15 years. 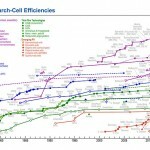 The above clearly shows that the mainstream crystalline solar panels are likely to remain the leading technology for the next 5-10 years, and existing and planned capacity plans of major manufacturers confirm this idea. Thin film could be an option for large ground based applications but is not very competitive in the rooftop segment due to lower efficiencies – meaning a smaller system on your roof. Emerging PV will take more than 10 years to become commercially attractive, and Multijunction or GaAs cells are clearly too expensive for consumer usage. Hence at the moment our advice is to not wait for better technology, since you could easily have paid back your solar panels (in 6-7 years) and made a decent profit before something better comes on to the market.